July 4th - 11th, ~1200 nmi, straight downwind, 7days, very little motoring. An amazingly quick trip. There was lots of food, fuel and water left over. We actually did some handsteering for something to do. Since it was downwind in dry, sunny weather, so why not? Otherwise, it was a normal trip, same watches, same menu, dolphins visited morning and night most days. 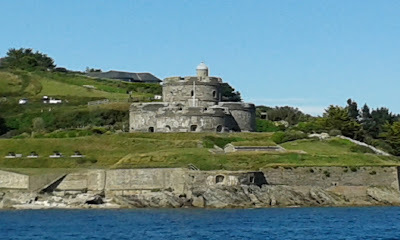 Falmouth Harbour and town were a beautiful sight when we arrived. Beautiful countryside marred by large motor yacht Aquila. She required a pilot boat to go to and from the fuel dock, where several fuel trucks were also required. Karl left us the next day. It was a short walk to the nearby train station. With a change to a Chunnel train in London, he was home in Paris for dinner that night... Thanks Karl! 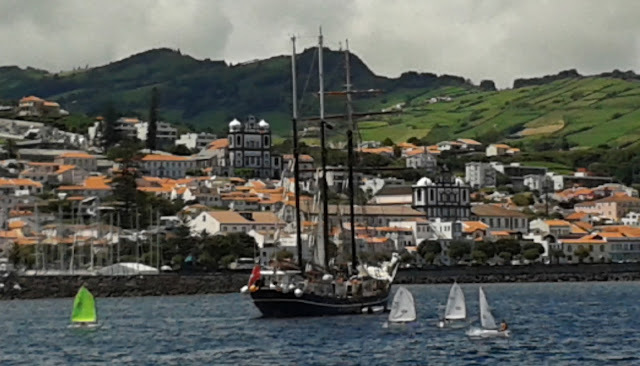 On June 30th, we left Faial on a pretty day sail past Sao Jorge and Pico islands to Terceira. The little marina in Praia da Vittoria was less crowded and easier to get around than at Horta where we were the 4th boat rafted off the wall. It had nice facilities and even bathtubs in the shower rooms! 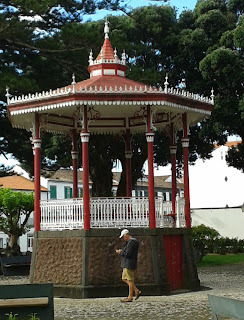 Terceira is small than Horta, but is more densely populated. Praia is also a much smaller town. We took a bus ride to a beautiful UNESCO protected town of Anchra do Heroismo one day. Karl Schulmeisters had joined us a few days before. On July 4th, there was a good weather window to start off for England, so we took off. 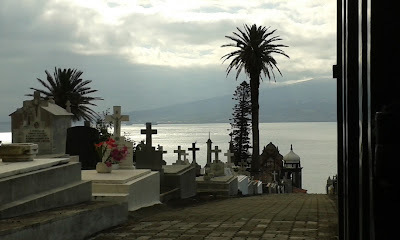 Faial is larger and more populous than Flores. 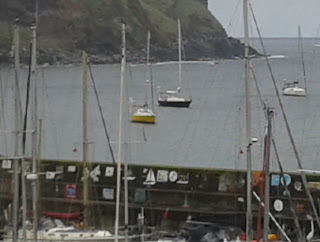 And the port and marina at Horta are much larger, it is truly a yachting crossroads of the Atlantic. There were boats from everywhere, bound for the UK, Europe and the Med. We had a few days before Karl arrived to clean the boat, make the inevitable repairs, and play tourist. In the mid-1980s there was a major volcanic eruption at one end of the island, so we went to have a look. It was a moonscape. On the 28th Karl arrived. 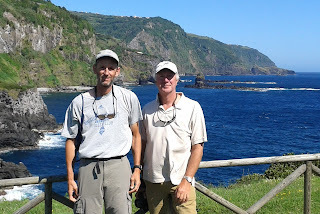 A couple days later we set out for Terceira. The Azores Islands are composed of nine volcanic islands in the North Atlantic Ocean about 850 mi west of continental Portugal, and are part of Portugal. They enjoy a mild, subtropical marine climate and seem especially suited to raising livestock and other agriculture. 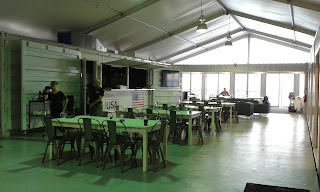 And they are about the cleanest, most orderly place we've ever seen. People were very friendly and easygoing. The language is Portuguese, although some speak English. We learned a few words of Portuguese and got along fine. The islands have been populated by Spanish or Portuguese for 600 years, and like Bermuda, there were no indigenous peoples present when the Europeans arrived. So there's a single modern culture, unlike the islands in the Pacific and the west coast of north America. The food and wine are wonderful and moderately priced. So provisioning and eating out were good. Flores is a rugged, lush island that seems like a remote outpost in the Atlantic. It's a steep volcanic island, covered with thick forests, vegetation and flowers, hence the name. They are especially blessed with hydrangeas. Sometimes, while walking on a country road , the only sound would be birdsong. There are several small towns on the island and a modern airport. The marina holds about a dozen yachts, from all over Europe. We saw just a few American and Canadian boats. We arrived a couple days before Alan's flight out. 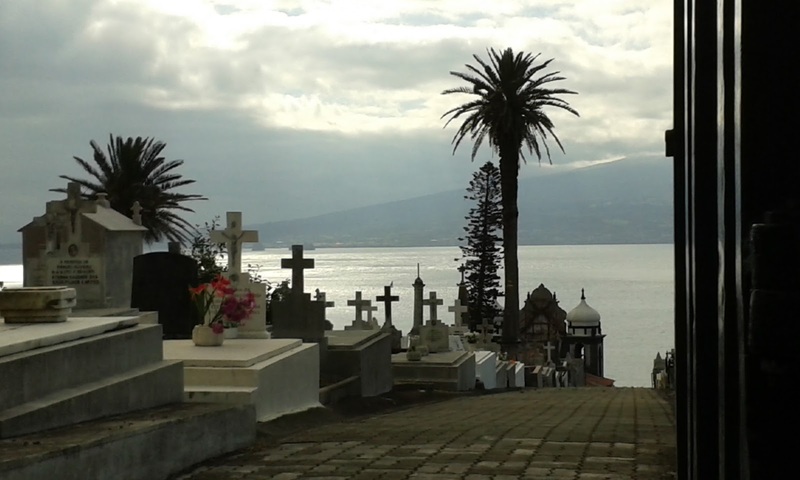 The day before Alan's flight, there was a short weather window to sail 150 miles to the island of Faial. So we left him at the bus stop and he stayed in a hotel by the airport on his last night. 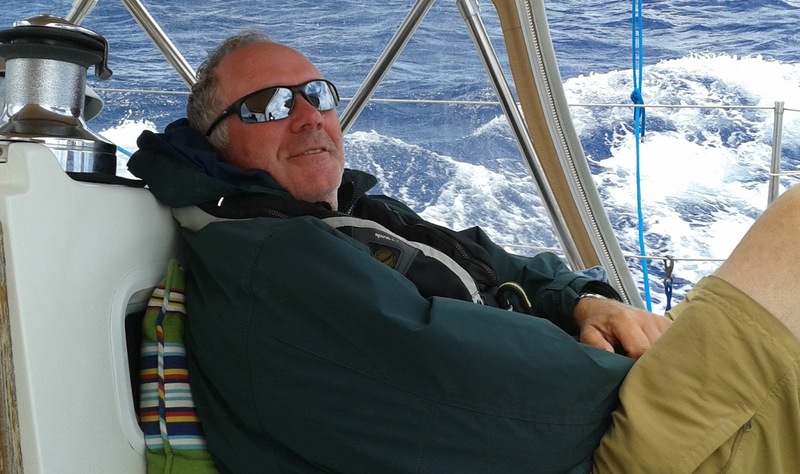 Alan was such a help and good company on the two legs from Florida to Bermuda to Flores. We were sorry to see him go. Late in the afternoon, on June 9th, we made the rounds of the St George anchorage to say goodbye to some of the other boats and we set off eastbound. We arranged with some of the boats to participate in an informal cruisers HF net at 1800 UTC everyday, but we had trouble finding them on the air. Bill and Alan slapped on the scop patches and took some dramamine, Kathi served dinner. Bermuda blocks the SE swells, so at first, seas were pretty flat. Then they start coming together after wrapping around the island making things a little bumpy. But that gradually dissipated. And because it was so late in the day, we had a quick dinner and the 2 off watch crew went below to sleep. Our usual watch system for all 3 legs, was 3 hours watches. We were all up for dinner and radio weather from 5pm to 7:30pm or so. Each evening around 5pm, 3-5 dolphins would often make a few passes. Kathi usually started preparing dinner around 5:30 and tried to have everything cleaned up and put away for the night by dark (which varied as we went east in a time zone, and north in latitude). That helped reduce clanking dishes and pans. Then I set up whatever snacks or drinks people would want when coming on watch during the night, to minimize effort and noise. The motion of the boat and the noise of wind and waves, makes sleep a little difficult. And the crew sleeps in the main cabin, ie, near the galley. So we try to minimize unnecessary additional noise. We were all usually up until after lunch and tried to get good naps in the afternoon. Fortunately, we had little rain, and winds were fairly steady in direction and speed, so no drama. It was good sailing, not too bumpy. Still, it's challenging to function onboard because the boat moves in all directions and not as predictably as you would hope. As we neared Flores (pronounced "Floresh"), we had fog and clouds, so the rugged island was barely visible as we approached the morning of June 20th. The tiny walled marina was full, so we had to anchor in the small bay outside with several other boats. That night the wind really piped up and a couple boats had to reset anchors. Several boats left the marina the next morning, so we were able to get inside and tie to a dock for around $20/night. Ahhhh, peace at last. 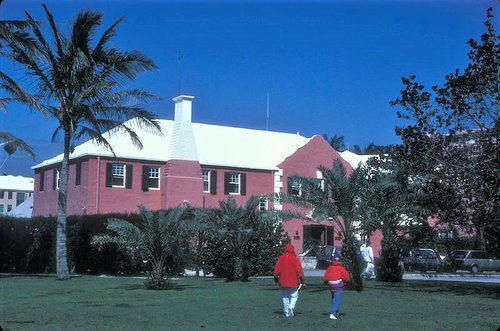 Bermuda is a lovely, civilized and very expensive subtropical outpost in the ocean. Our first stop was St George, an enclosed bay, with about 20 other cruising boats at anchor from all over. There was a Dutch boat we last saw in the Marquesas in 2010. St George is a small village, so there's not much to do there. Bermuda's main population center is Hamilton, the capital farther along the string of islands So after a couple days recuperation from our passage, we took the bus to Hamilton to see what was there. While we were gone, Giffords' Totem arrived from St Martin and we had a quick visit. We hadn't seen them since New Years Day in Sydney, 2012! We both moved our boats to Hamilton. Jarana moored at the very expensive, but very convenient and hospitable Royal Bermuda YC. Paul Bieker of Seattle kindly gave all of us a tour of the Oracle Americas Cup campaign base. 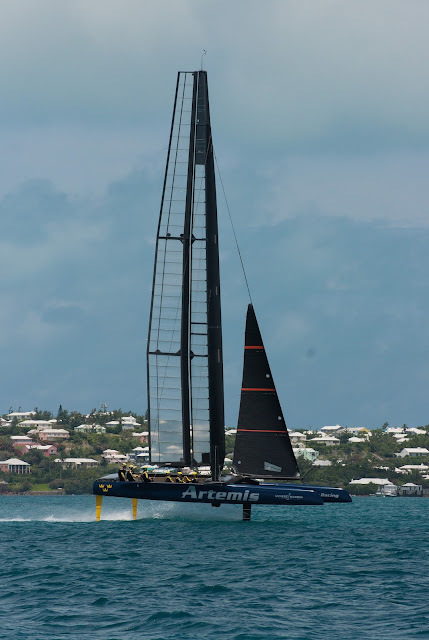 Artemis and Oracle were out practicing daily, so we got a good look at them streaking around. 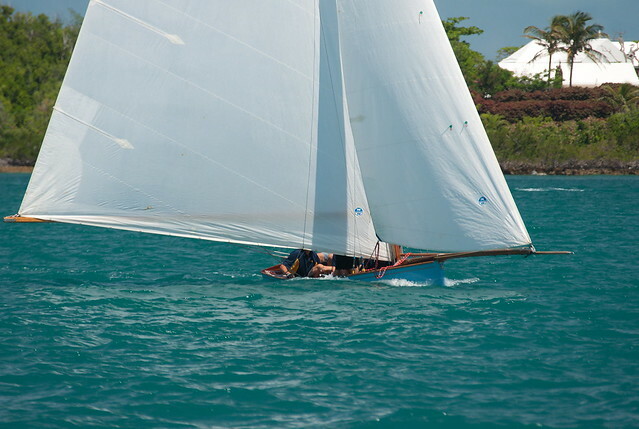 A few days later, we took the boat out and watched the fitted dinghy races. Bill loaded a bunch of pictures on Flickr. Click on the image below to go to the Flickr page. After a very pleasant time in Bermuda, our wallets were running dry and the weather window opened up, so it was time to put on our scop patches and go to sea again. Next stop: Flores Island, Azores approx 1800 n mi NE. Dates: May 20,2016 - May 28, 2016 Distance: 970nmi But we sailed: 1027nmi Doh! On May 21st, after 6 weeks of hard work preparing the boat in Florida, we exited Port Everglades out into the Gulf Stream. Alan Johnson from Seattle was on board to help us get the boat to Bernuda and the Azores. We were really glad he had the time to come with us. 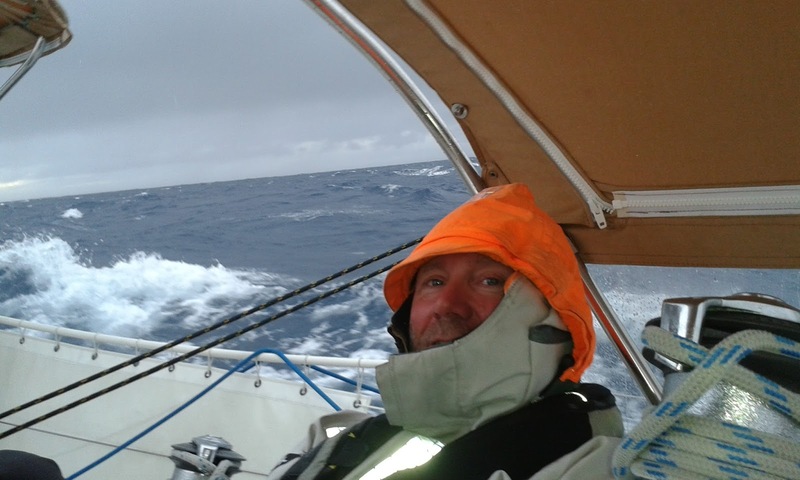 Fortunately, the passage started out with moderate winds and low seas. It had been a long time since we'd done an ocean passage, so it was a big adjustment to get our sea legs again. As usual, Kathi had prepared some hot meals in advance, but the weather was so warm, she didn't want to turn on the stove. So we ate a lot of salads and sandwiches at first. To start out, we all used scopolomine for seasickness, but both Bill and Alan continued to struggle with it. Once Alan added Dramamine to the mix, he could function better. It's most difficult being down below in the cabin, so he spent all his waking hours out in the cockpit and stood very long watches. Thanks Alan, it was a great help. And, we caught a big wahoo, with lots of big white teeth. Unfortunately, the battery in my camera was dead, so no photos.. This turned out to be the hardest of the 3 passages across the Atlantic. 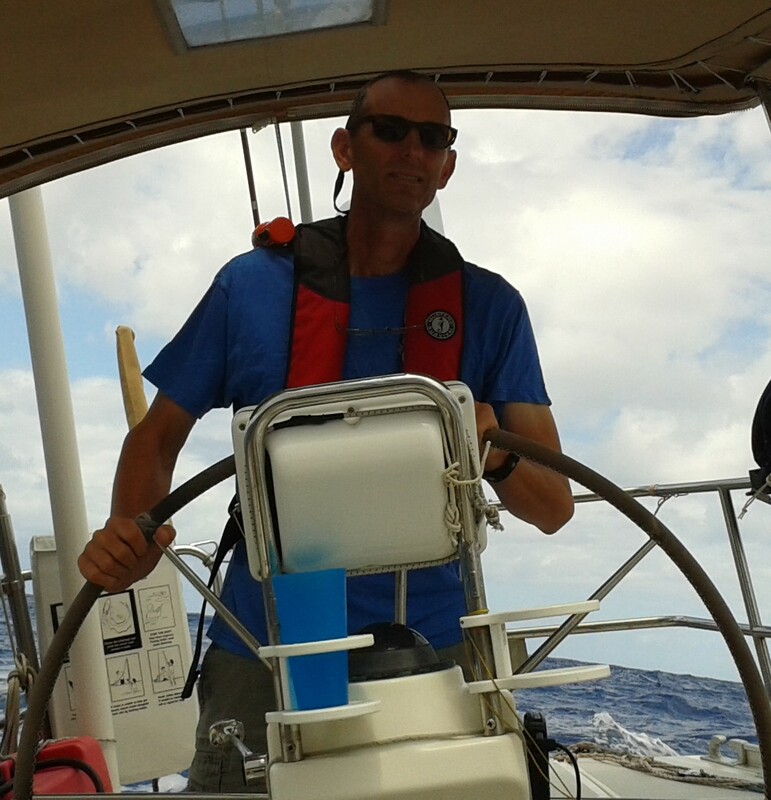 For a couple days, we sailed upwind (ugh! ), somewhat unnecessarily, and seas were rough and confused. But, eventually it was over. St George Harbour, Bermuda, was a welcome and peaceful anchorage. Whew! We were glad to put that all behind us. And, we were looking forward to a rendezvous with friends.